ISLAMABAD (92 News) – Former interior minister Rehman Malik has thanked China for recommending Pakistan’s inclusion in the Nuclear Suppliers Group. Talking to the media on Monday, he feared that India could attack Pakistan on the western border by bringing his forces in Afghanistan. He said that US President Barack Obama had double standards as he was showing love towards Indian PM Narendra Modi. “Once an enemy becomes a friend of America at another time,” he said. 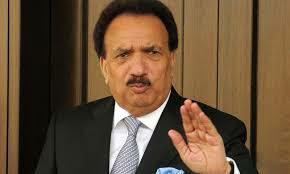 Rehman Malik said that Pakistan will have to come out of the burden of ‘Do More’. He said that Mullah Mansour was hit with a drone in Pakistan after bringing him from Iran. “Four neighboring countries of Pakistan have become her enemy,” he added.